Let us face it about 99% of all mattresses out there will have an element of polyester included as the build. Some will have a majority element of this stuff and some will have minimal. If you don’t know what it is, and how it is used, you could be paying top whack for something that is deemed to be the cheapest upholstery element used in mattresses. Polyester is a synthetic resin that is spun into a range of fabrics, waddings and fibre fillings. We must admit at this point that we are not in the position to offer any kind of scientific explanation of the process and composition of producing polyester. When we use the term ‘polyester’ we are referring to the component as used by nearly all mattress manufacturers. This mattress fibre product is generally described as a non-woven, thermally bonded material of polyester fibres to form a mattress sized pad of varying densities and weights. Because of the prolific use of this product, not only in mattresses but sofas, duvets, chairs, pillows etc, it stands to reason that this component can be made to feel either luxuriously soft, relatively firm, substantially firm or whatever. If there is a particular requirement, there will be a product to suit. As the image above demonstrates, basic mattress pads can come in a variety of weights and depths, but still bought and sold on a specific GSM [ Grams per Square Metre: Know your GSM times table here. Out of all the mattress descriptions we have seen, we have never seen a particular weight of product given to the consumer. The description will also give a pseudonym to the product such as premium white fibre, anti-allergenic upholstery, soft white fibre and suchlike. At the end of the day, it is all polyester fibre and is the cheapest product to be used as a standalone upholstery component within a mattress. This is not to say it does not have it’s uses. When mixed with other materials, such as cotton it produces an affordable comforting product (Known as RPC: rebound poly-cotton). The polyester element in this acts as a bonding agent to keep all the cotton fibres together as well as to make the cotton element FR (fire retardant) [Note: cotton is not naturally FR]. If mixed also with wool, it again produces a wonderfully soft component WPC: wool poly-cotton). It can be mixed with just about anything to create a new product that has a purpose within the mattress. But never forget, this is always going to be an economical substitute for pure natural fibres. What is White Fibre in a mattress? White fibre is a term that’s recently started to appear on retailers mattresses such as Marks and Spencer and Dreams. It gives the illusion of a clean new fibre but in reality, it is simply another form of polyester. Sometimes White fibre is described as having a higher loft but it’s just another entry-level synthetic fibre. if you read White fibre just translate to polyester. How can you tell how much is used? Polyester pads come in varying weights and depths: Usually 300 GSM / 500 GSM / 600 GSM / 800 GSM / 1000 GSM / 1200 GSM. And any weight combination you can come up with using these set weights. A pad can also be made to combine two elements of construction the support and Comfort. This means that half the pad can be quite compressed to be more supportive and the other half of the pad can be quite soft offering the comfort (Duo Pad). These pads are often in the weight range of 800 – 1200 GSM and is often used to comprise the total upholstery element within the mattress. Cheaper budget and economy mattresses will have little more than either 600 GSM or 800 GSM. Completely worthless to offer a degree of overall comfort, but they do fit in with a certain price point. It actually amazes me that people still buy this quality of mattress and yet there are factories that specialise in churning these out in their thousands each and every day. What are the downsides to polyester? Polyester pads, unlike polyester fabric, does not like moisture! It breaks down quite quickly from perspiration to an unrecoverable state. Many of us are familiar with cheap duvets despite starting life as a thick luxurious blanket, they soon become flat and lifeless. This is the same with polyester pads. Invariably they are used as the primary comfort layer and without adequate protection, the copious amount of perspiration we emit each night will not take too long to penetrate the mattress. There is also the constant pressure applied to it each night at eight or so hours at a time. It is not a sturdy enough material to take this night after night before refusing to spring back to life. Therefore, you are left with indentation, settlement, dips call it what you will. The component is dying and there is nothing you can do to revive it. Modern production techniques are now introducing new ways to help combat this inherent fault. The way the polyester is formed for example: rather than having the fibres laid horizontally with each other, they are arranged vertically (Vertically Aligned Fibres). They are also crimped which acts as a spring, going some way to offer an extra degree of life to the product. So how do you compromise with polyester? Your ultimate aim is to ensure you keep the poly wadding as good as new for the longest period of time. Sweat and moisture dissipated from your body as you sleep is the waddings worst enemy. Do all you possibly can to keep this away from your mattress. 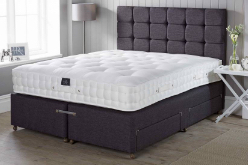 Using some sort of cushioning barrier between the mattress and your bottom sheet will, in the long run, save you a fortune and keep your mattress looking like new for considerably longer. An ideal barrier could be a very basic budget £10 quilt (duvet) from the supermarket ideally in a cheap washable cover used as a mattress protector. When this flattens you will be replacing the £10 quilt rather than the entire mattress. This option is considerably better than a purpose built mattress protector and serves a dual function. Firstly, you are sleeping on an additional layer of polyester (the quilt) which will aid the comfort, and it is also taking the brunt of continuous wear rather than the mattress. I know this sounds like a lot of effort, but it really is a simple and worthwhile procedure. Your mattress should not have been overly expensive to start with and the regular maintenance is just a matter of changing an additional duvet cover now and again. It has to be said that polyester pads have their place in the market, particularly when a budget is an influencing factor. However, you should not be paying top dollar for them. Mattress descriptions that do not mention any kind of upholstery element will no doubt be entirely polyester based, of a weight unknown. The inclusion of natural fibres such as Cotton or Wool in a description without any associated measure of weight should also be taken with a pinch of salt unless you can establish they are of a significant amount. Many manufacturers dress up their mattresses to disguise what actually lies beneath. Our take on this subject is manufacturers could easily produce a mattress with a more substantial element of upholstery by cutting the costs that do not really affect the user; Such as not applying handles, reducing the quality of the fabric, tufting rather than quilting. 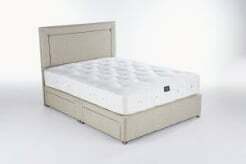 It’s pointless having a nice looking mattress if the internal components do not have the tendency to last. Need more help? Then why not give our small friendly team a call on 0161 437 4419 for some more mattress help?